View all products by No Trees! No Trees! 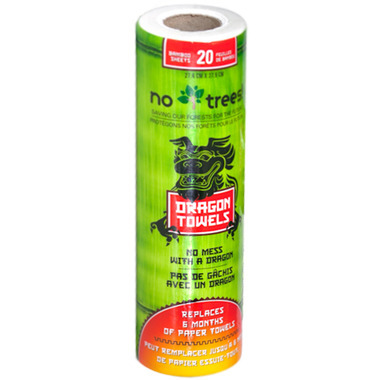 Bamboo Dragon Towels are designed to be more absorbent than almost any other product! Constructed with 100% bamboo, these towels allow you to rinse them out and use them again or place them into the laundry and machine wash up to 25 times. These Bamboo Towels are 100% Biodegradable, so once they have worn through, you can discard them in your compost. Awesome wash well make sure hung dry. Only problem is where to put them after you wash them. Handy having paper towels on a roll but after they are taking off? Then what? Love them! They are incredibly soft and absorbent, yet they dry quickly and wash up well in the washing machine. I love this product. They are very soft to use for baby clean ups. Absorbent and durable. Wash well in the washing machine. Have already purchased more as gifts. Very strong and absorbent. Mine did survive the washing machine and one time accidentally the dryer. Happy with the product, wish the packaging was paper not plastic. Will order again but these will last awhile. Soft and absorbent, but unfortunately they don't stand up to being washed like another brand I had. Makes them slightly less appealing, but they're still useful. These are great, very strong, much better at absorbing messes than regular paper towels. The only downside is they are wrapped in plastic. Fell apart in the wash, which essentially means I paid $10 for one roll of paper towel. Not recommended at all. Love these. I use them as a kitchen dish cloth...they take a long time before they get smelly...and then I just throw them out. I put them in the top of the dishwasher a few times to clean them, and they last a few weeks each!!!! Sturdy. I like using them in the bathroom and can refreshed with oxy bleach. I do not recommend these if you are buying them because they can be washed. Even though says machine washable this is not true, one time in washer and they completely fell apart. I searched a long time to find this. I use them in the kitchen and when they finally get raggedy I just throw them out. I even javex them. Looked into bamboo fibre cloths for ecology, but had also heard of its anti-bacterial property; most dish cloths smell moldy after a few days use. These never pick up any bad odors! They are very handy, I wash my dishes with them, counter tops, etc. Throw them in the wash when they get dirty, and when they degrade (after a few washes) you can compost them. They're very durable... each cloth lasts a few weeks. Will buy more when needed. Save money - don't buy regular paper towels when these bamboo towels are more absorbent and can be reused so many times!!! It's also great for the environment! I love this product so much that I bought 5 rolls. Love these towels. More absorptive than most paper towels and you can reuse them over and over again!